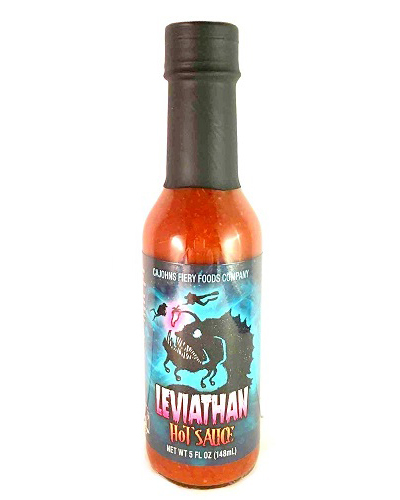 CaJohns Leviathan Hot Sauce, 5oz. : Across the spectrum of chile colors, the brown or "chocolate" varieties are the most rare, exotic and perhaps the most misunderstood. They are pod for pod among the hottest of the colors in each cultivar. The Trinidad Dougla has the narrowest band between low and high in SHU in tests performs by the Chile Pepper Institute at NMSU. I have put these pods together to create a giant of heat and flavor that will surely please the experienced Chilehead and intimidate those with an everyday palate. Beware of Leviathan, it lures you in with the call of chocolate, but this sauce is not for the top of your ice cream! Heat level: XXHot POP: (percentage of peppers) 46% Ingredients: Chocolate 7-Pot, Chocolate Bhut Jolokia, Chocolate Habanero, Chocolate Scotch Bonnet, Trinidad Dugla, Distilled Vinegar, Apple Cider Vinegar, Garlic Powder, Salt, Cane Sugar, lemon Extract, Spices.